A Florida 14-year-old was busted on charges of soliciting murder after the boy “hired” a classmate to murder his entire family and stage it as a burglary gone wrong, police say. 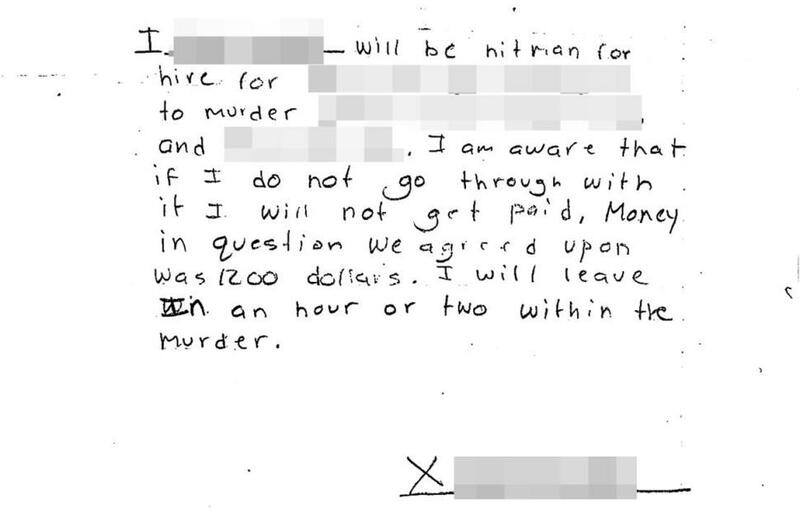 The teen is sitting in juvenile detention after his arrest in Port St. Lucie for writing out a contract, signed by a friend, ordering the murders of his dad, stepmom and older stepbrother for $1,200, according to cops. The teen’s dad found the disturbing note and a folding knife in his backpack over the weekend, police said in a charging document. The disturbed teen told cops he wanted his friend to burst into the home and shoot up his relatives in a staged burglary gone wrong. The boy, would then run from his bedroom to a neighbor’s house and have them call 911, court documents show. Cops followed up with the classmate, who admitted he is friendly with the boy and signed the contract, but considered it a joke and never planned to carry out the killings. The other teen won't face charges, Port St. Lucie spokesman Sgt. Frank Sabol told the Daily News. The defendant, too, had not gathered any cash or gotten a gun to use in the crime. But the child had been depressed and wanted to hurt himself, but had no specific plans, police wrote in an arrest document. The teen had gotten in trouble for bad grades and been grounded, he told a detective. In April 2014, the boy had taken a knife to school and threatened to kill classmates, the teen’s dad told police. The boy is held on a charge of solicitation to commit first degree murder and could face a total of three charges for each family member he wanted dead, Sabol told the News. The state attorney will decide if the boy is charged as an adult, Sabol said.